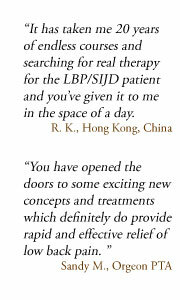 Richard DonTigny is a physical therapist who has done groundbreaking work in what will eventually be recognized as landmark work in the area of back pain generally and specifically in SIJD. I am a physical therapist and have benefited from his approach personally, as have hundreds of patients I have treated with his approach. You have to do some study and persevere. If done right you can be on your way to a much improved lifestyle without pain in a short time. This program was developed principally for use by patients who cannot find competent help and for professionals who treat patients with low back pain. 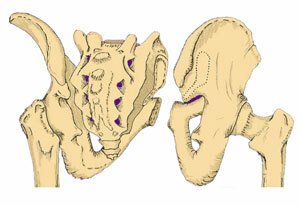 This is the minimum of what you must know to properly diagnose and treat pain in the low back and pelvis. Hands-on instruction in appropriate and painless correction is strongly suggested. The Dynamic Core Program for patients is an 18 page program with precise instructions for self-correction. If you suffer from the symptoms described on this website, personal application of these exercises will relieve your pain. This is a PDF program that you may download and print so you can begin corrections immediately. This is available toward the end of this program for only $10.00. A Home program CD for patients with a full corrective exercise program in PDF and PowerPoint, simplified mechanics, an 18 minute film strip of corrective exercise demonstrations and FAQs is also available toward the end of this program for $35.00. Those patients studying this and suffering with low back pain may benefit from the method, however, if you suffer from numbness and weakness in the extremities or loss of bowel or bladder control, you will need to see your physician before continuing. A critical analysis of the movement, function and pathology of the pelvic joints reveals a reversible, biomechanical, vulnerability of the sacroiliac joints to dysfunction through injury or minor trauma. This is the principal cause of common low back pain. A relatively simple, precise correction of this commonly overlooked dysfunction of the sacroiliac joints will restore normal function and provide immediate relief of pain in most cases. It doesn't matter if the pain is acute or chronic, moderate or severe or in women during or after pregnancy. 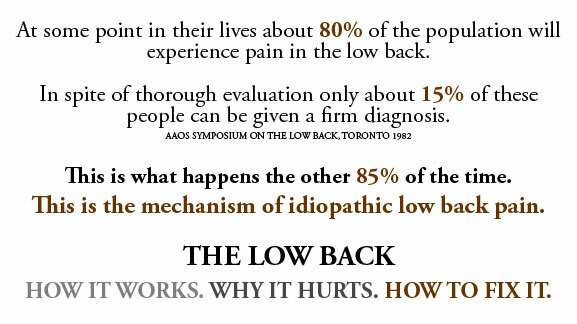 With a thorough knowledge of these biomechanics and using the DonTigny Method of correction, the skilled practitioner can have at least 80-90% of all patients with low back pain free of pain in about ten minutes. Recurrence of the dysfunction may occur, but can be controlled and prevented with appropriate corrective exercises. When the sacroiliac joints are unstable they can be made more stable with corrections and the use of a lumbosacral support. If instability continues use the least invasive means possible to regain stability. After corrective exercises and supports the next step should be proliferant injections into the long and short posterior sacroiliac ligaments and no others until the joints are stable. In the event of major trauma and grossly unstable ligaments, fixation may be considered, but this should only be done after corrections of the dysfunction have been made to the weight-loaded position of ligamentous balance. Discovery favors the prepared mind. The DonTigny Method is fully protected by copyright law.